Located on the western side of the central historic Alter Markt, just behind the town hall in Cologne, Germany, lies the new subway station Rathaus’. This is one of the first new stations to open on the North-South city railway. There are two entrances to the subway station: one at the Alter Markt and the other at the Red House. Pedestrians’ first steps lead them into the circular intermediate level of the subway station. Once inside, they can move via two entrances down to platform level. The futuristic design of the intermediate level has contrasting red and blue surfaces with silver ceilings and walls. The artfully designed ceiling by architect Joachim Schürmann + Partners features architectural mesh MONTANA 1961 manufactured by HAVER & BOECKER. MONTANA is a stainless-steel woven wire mesh that has a distinctive three-dimensional appearance formed using a special process. The resulting unique structure provides increased surface area making it the perfect choice for use in enhancing sound absorption systems. Every single mesh element was custom-made by HAVER & BOECKER and integrated into the ceiling structure. A total of 50 elements of MONTANA 1961 were used to create this spectacular circular ceiling. 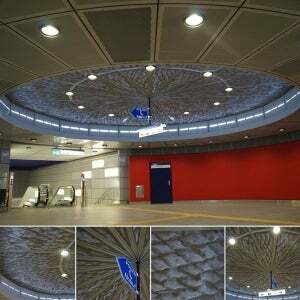 An additional 20 mesh elements of weave type DOGLA-TRIO 1032 were used for other ceiling elements.